This is no easy time to be a passive investor . Sluggishness and sloth are on the run, hounded by the January urge to FIX EVERYTHING NOW! Gym membership is soaring, joggers are pounding the streets, and the magazines are touting 10 easy steps to a faster, fitter, slimmer you. Well, you won’t find any of that nonsense here. Instead, let’s kick back down a gear with the world debut of the Slow & Steady passive investment portfolio. 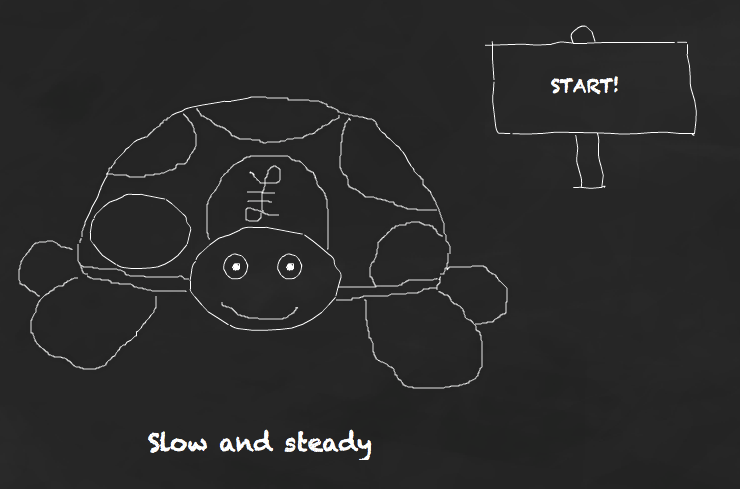 The Slow & Steady portfolio is a model portfolio  for Monevator that aims to illustrate how new private investors can overcome some of the difficulties associated with passive investing in the UK. In particular, we’ll use the portfolio to offer clear strategies for investing relatively modest sums without incurring injurious costs. I’ll report back periodically on the portfolio’s performance, and hopefully it will develop into a useful long-term project. Note: This is just an exercise. It’s no more than my own response to the practicalities of passive investing in the UK, according to the assumptions laid out below. The Slow & Steady portfolio is not intended as a real-world solution to any individual’s investing needs (including mine). You can see an archive  of all the posts in this model portfolio series, including the latest updates. Initial contribution: £3,000 lump sum. Regular contribution: £750 per quarter. Investment vehicle: Index funds only . No trading fees incurred. ETF/Vanguard trading fees are prohibitive at this level of contribution. Fund selection: Index funds are chosen on the basis of availability to UK retail investors on an execution-only basis. The cost of the portfolio will be kept as low as possible by choosing funds with the lowest Total Expense Ratio  (TER) available without paying trading fees. Each fund will track a benchmark index that is appropriate to its role in the portfolio’s overall asset allocation. Asset allocation: The portfolio will not cover every asset class due to its relatively small size and the lack of suitable tracker products available. The core of the portfolio is invested in UK equities and developed world equities. The Developed World ex-UK allocation is split into four separate funds because a single, suitable fund is not available. Further explanation here . Emerging markets are included for additional geographic diversification and as an expected returns booster. UK Gilts should help to diversify the equity risk inherent in the portfolio. The 80% allocation to equity should be considered aggressive and is a reflection of the long time horizon and my personal risk tolerance. The allocation to equity will be adjusted as the time horizon shrinks. Purchases: All funds can be purchased from TD Direct Investing or iWeb . Rebalancing: the portfolio will be roughly rebalanced to the target asset allocations whenever new money is added. Tax: The portfolio is assumed to be held in a tax-sheltered stocks and shares ISA. Fund ISAs from Interactive Investor are fee-free. Dividends: All funds chosen are accumulation funds. Accumulation funds automatically reinvest dividends back into the fund (in contrast to income funds which distribute dividends back to the investor). Performance: I shall report back on the portfolio’s performance once per quarter. Split between four funds covering North America, Europe, the developed Pacific and Japan. Right, that’s all there is to the Slow & Steady portfolio for now. We’ll check back in a few months time to see how things are going.